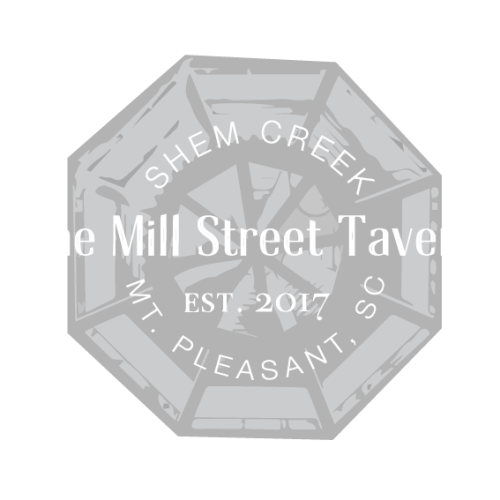 Welcome to Charleston’s newest and most exciting gathering place, The Mill Street Tavern. Located on Historic Shem Creek in Mt. Pleasant, The Mill takes its place along the banks currently home to waterfront restaurants and bars in the most picturesque setting. With views of local marshes, the Ravenel Bridge, and boaters sailing by, The Mill Street Tavern is the place all want to be for breakfast, lunch, and dinner, and for an evening on the rooftop deck. The Mill Street Tavern offers a variety of different seating options including our indoor dining room and bar and the upstairs outdoor patio and bar. Housed near the site of the "Greenwich Mill" the first tidal Mill in the world, patrons will see a recreated mill as they approach the restaurant and period mill artifacts via see-through panels in the main dining area. The restaurant and bar will charm all with a collection of elements brought over from Ireland, childhood home to owner Peter Woodman, a grouping of international effects, as well as beautiful Lowcountry finds. The main dining area boasts floor to ceiling woodwork and wall to wall windows viewing Shem Creek, while the rooftop deck is adorned with wrought iron work throughout from Egypt and gives uninterrupted views of the creek. Each part of the restaurant has a history and is a story within itself. Best Lunch, Brunch and Dinner. Roof Top Dinning. Southern Seafood & Smoke House Cuisine. Fri & Sat- Open Late! PARKING: We share the Shem Creek Bar and Grill parking lot. In addition, we have leased the parking lot next door.